A rare register from these Scottish parishes. Part of the list of baptisms in Bairnie and Tillydesk. 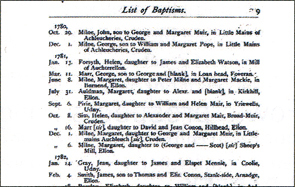 Published in 1907 and attributed to the Scottish Record Society, this is a register of baptisms in the parishes of Bairnie and Tillydesk from 1763 to 1801. This could be a great help for finding residences of ancestors. Probably because of the disturbed times after the 1745 Jacobite rebellion, the practice in Episcopal congregations of bringing infants to be baptised in the chapels was discontinued. Instead, each priest took the baptisms to the infants, travelling through the districts assigned to him. The place names mentioned are therefore probably the residences of the parents of the baptised. The chapel seems to have been transferred from Bairnie to Tillydesk around 1776 and the transcribers have thus allocated entries pre-1775 (May) to Bairnie and the rest to Tillydesk. The original document has indexes of names and places, and the PDF file is searchable. The data is in freehand rather than being entered on a form, but follows a common layout of dates, names of infants and parents, and place.